The sad thing about John Updike’s being dead, other than the loss in general, is the loss in literary size. Like my #1 literary hero Reynolds Price, Updike could do it all: novels, essays, short stories, poetry, critiques, nonfiction, it was enough to make you want to hang up your computer forever. But the other thing, Updike being almost exactly my own age, is the timing. When I read his obituary I was just back from a trip east to give a eulogy for my greatly beloved sister Mimi (Updike was, in fact, exactly in between Mimi’s age and mine) and working on a eulogy for my also beloved old, old friend, JoAnn. Those being two eulogies too many for one young year. Mimi had grown frail with a multiplicity of complaints in recent years, and did not have a lot of enthusiasm for a long decline. So when a cluster of strokes and heart attacks lifted her rather swiftly heavenward it was probably fine with her, if not good for the rest of us. JoAnn, though, was six years younger than Updike, a hearty, joyous soul who had survived breast cancer decades ago and a recurrence somewhat later. One night she sat down on the edge of her bed, readying for a night’s sleep. Some tiny something, a piece of plaque somewhere, broke off into her blood stream and the next moment she was dead. Most of us would sign up for this swift, painless exit, but not right now please. Being very kind to one another has taken on a new urgency. Planes crash, fires and floods and earthquakes happen, people who are supposed to be here suddenly aren’t. Being kind, spreading a little ray of joy when you find one, noticing the smell of approaching rain – so the IRA has tanked and the stimulus package can’t be fathomed; still, maybe it’s worth paying attention to the smell of almost-rain. A few blocks up Arguello Boulevard from our house, in the storied space that is now the Presidio National Park, sculptor Andy Goldsworthy recently created a breathtakingly lovely new work titled Spire. 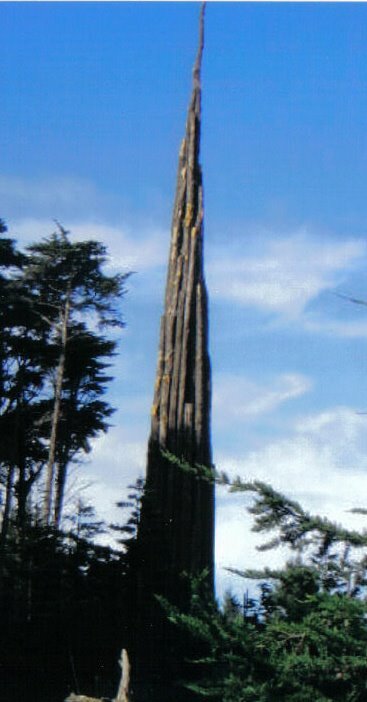 Made of trees felled in the effort to return the Presidio to its natural state, Spire is surrounded by newly planted young trees. As those trees grow, they will eventually cause Spire to disappear, blending back into the forest. It’s all a part of this mystical effort to keep the planet spinning as intended: forests come and go, the universe continues. Which seems quite a comfortable arrangement. John Updike could have worked this into a darned good story. Oh, Fran. So sorry to hear about your recent loss. I can’t imagine what it’s like to lose your sister. I have one younger sister. We’re very close, and I don’t know how either one of us will cope with losing the other. I’m sure one of us will one day, but my goodness, it must be hard. So brave of you to deliver the eulogy. I have so much respect for people who are able to do that for really close family. And to lose a close friend at the same time—gosh. It reminds me of that line from Hamlet: “When sorrows come, they come not in single spies, but in battalions.” For different reasons, I’ve been trying to remember the same things you have: to try to stop and appreciate life. We are all getting so stressed by the world and the economy, we’re forgetting that it’s all still precious. Really good to hear your “voice” again.